My calendar says spring has arrived. Although it still feels more like winter than spring here, I'm enjoying the longer days and hints of green I see. Gathering ideas for our new cottage is enjoyable, too. I like toile, and hope to use it somewhere. Perhaps in the master bedroom. I hope you don't mind if I share some photos I found with you. It's always fun to look, right? ﻿﻿﻿﻿﻿1. Vibrant red and ivory French Country. This appeals to my love of mixing patterns. 2. Subdued French Laundry. Grain sack, ticking and toile. Very pleasing. 3. English Country. Scalloped edges and ticking. A nice light and airy look. 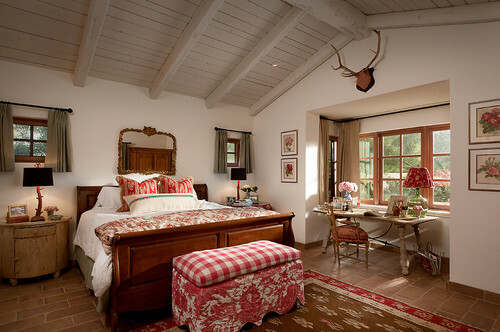 Traditional Bedroom by Washington Interior Designers & Decorators Sroka Design, Inc.
4. Here toile takes a back seat to the bold red door and throw. I think I'm more in love with that fireplace than anything else. 5. French Country Estate. The bench's buffalo check and toile definitely make a statement. 6. Colonial Williamsburg. Formal, structured -- a safe use of toile. No surprises for anyone who's a true traditionalist. I love that chair, by the way. ﻿﻿7. Toile with a Celtic twist. Now this is different -- in a good way. Tailored and fun at the same time. The pillows punch it up. 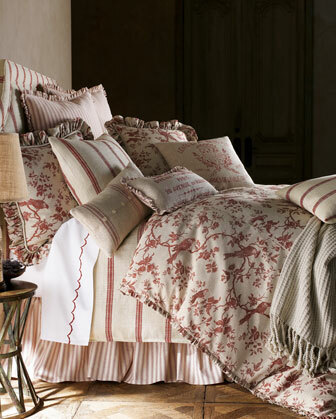 Horchow: Country House Bedding. 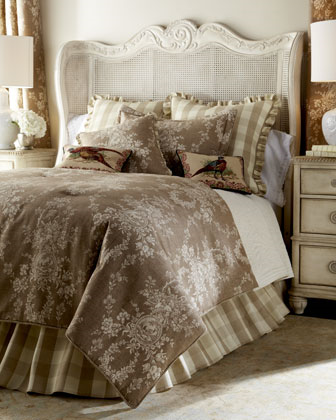 Sherry Kline Home Collection. 8. Taupe and white always look right together. 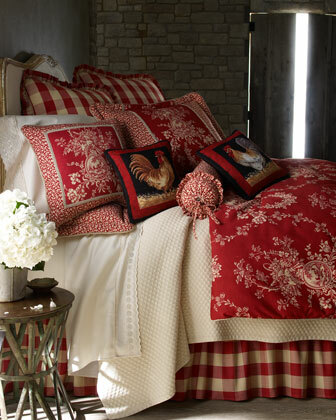 And, oh those gorgeous needlepoint pheasant pillows. 9. Nearly neutral. 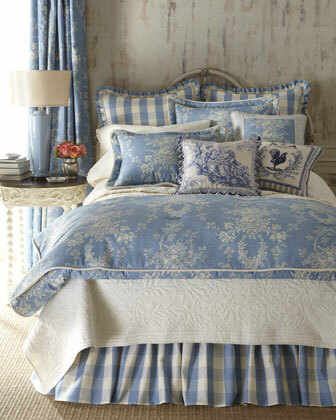 Just a touch of soft blue in this toile. So serene. 10. I'm not a big wallpaper fan, but I love the café au lait shams with the white. The headboard is fabulous. 11. Classic blue and white. Does it ever really go out of style? 12. 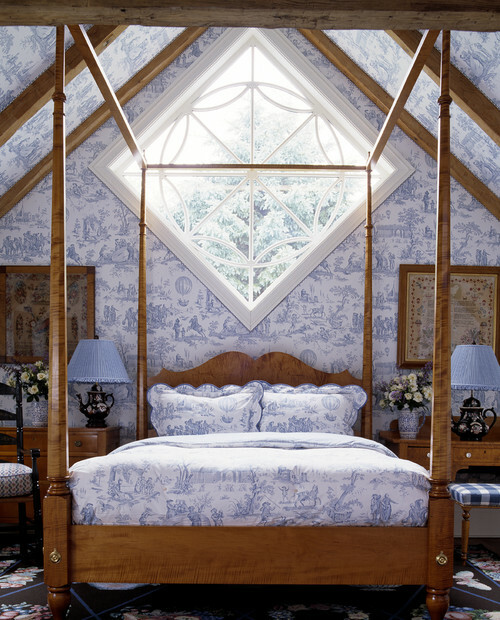 If you can't get enough of blue and white toile, then this could be the bedroom of your dreams. Just don't ask me to come and hang the wallpaper. 13. Lovely toile in a room where I'd have breakfast in bed. I'll always appreciate four poster beds, even if I never own one. Love that bench. 14. Blue and white and elegant all over. 15. Luxurious blue and yellow. 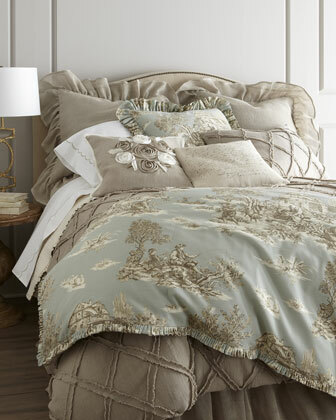 Once upon a time I had a guest room in these colors. I loved it. 16. Like a pretty garden. It makes me want to plant something. My friend Kim @ Exquisitely Unremarkable blogged about adding pink to her green bedroom. I love the combination. This is by no means an exhaustive look at toile. Simply a few examples of interest. 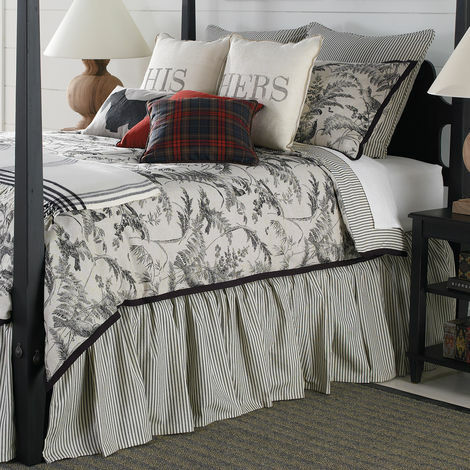 Toile is popular now, and is available in contemporary patterns, as well as traditional. Just a reminder that the Every Room In The House party is still going in The Master Bedroom. 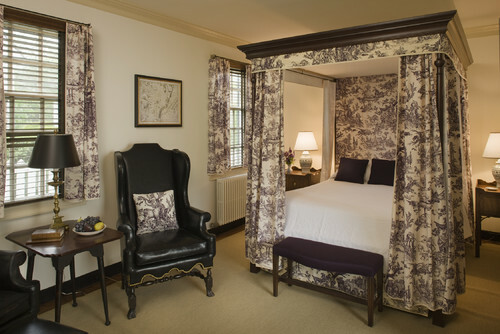 Link up your master bedroom ideas, or show off your own master bedroom now through the end of March (not toile required). 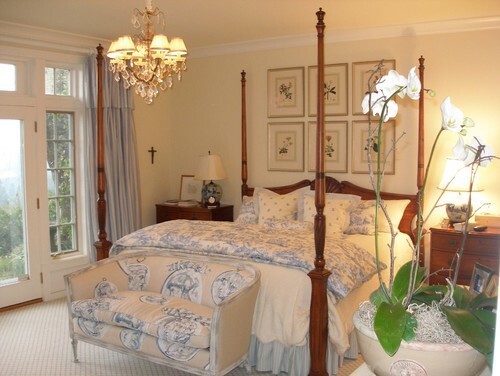 And visit the master bedroom posts of others who have joined the party. I love toile. I think I have at least a touch of it in every room in my home. Lucky you, Joan. I hope to be able to say that soon. I love toile and need to put more in my home. Lovely pictures. Thank you. I'm glad you enjoyed them. Nancy, I was reading and enjoying the pretty pictures (especially the Horchow bedding- I actually have that one pinned, too!) when I reached number 16 and had to do a double take!! I am completely flattered, beyond measure, to be included and listed along with these most exquisite rooms!! Wow, what a nice way to start the weekend! Thanks for the shout out! My pleasure, Kim. You always inspire me. 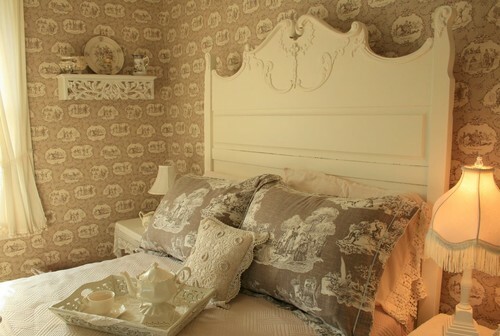 Love toile! I can't choose a favorite! I know, Cindy. I love them all. I think a toile table would be lovely. Thanks for stopping by. I'm glad you enjoyed the collection. Nancy, I love toile! Had a lot of it in my master bedroom in our previous home. The bathroom even had blue and white toile wallpaper. I still add touches of it now and then in our bedroom here. I especially adore it mixed with ticking and grain sack. Pinning to my board, "Tickled by ticking, toile, and grain sack. The reds are my favorites! Thanks for sharing with SYC. Oh they're all so gorgeous - but that grey Celtic one makes me swoon - seriously ! 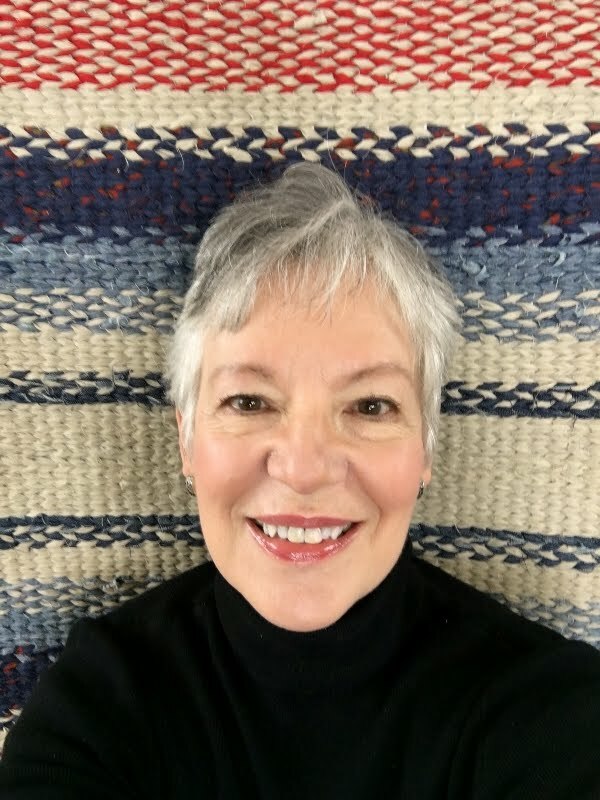 Now I need to know - your blog header - is that your home? How over the top beautiful - charming - perfect !!! Lovely photos full of great ideas. I needed some ideas for bed pillows and this is a wonderful source. Thank you. Wow! I am a toile lover, and as far as I am concerned, it will always be in style. Classics are, aren't they? I have red toile in my master bedroom, and, in my last house, I had red toile wallpaper in our powder room. Unfortunately, that particular pattern has been discontinued! Thanks for the lovely photos; I'm pinning like mad! So glad you stopped by, Ellen. I agree that toile is a classic. I've loved it for a long time. Have a great weekend! What's not to love! 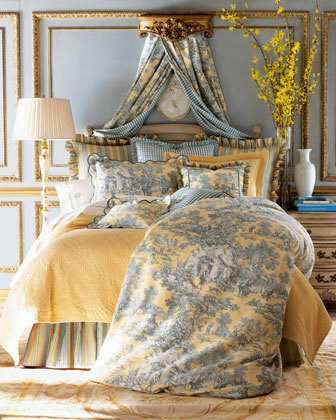 I hope toile will never go out of style! 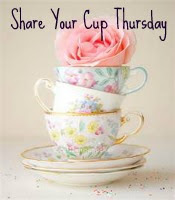 Thanks so much for sharing at Amaze Me Monday...hop back over, you're being featured! Your comments bring me joy! Thanks for stopping by. 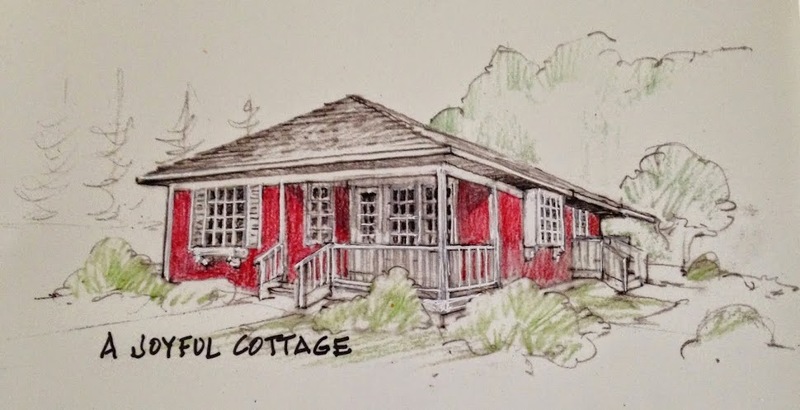 Subscribe to A Joyful Cottage for email delivery. cot·tage / ˈkätij/ n. A small, single-storied house, especially in the country. For as long as I can remember I've loved cottages. These cozy places, with abundant flowers and sunshine, give me a sense of peace and contentment. Walking through the front door of a cottage one sees simple, timeless decor: fresh cut flowers in unexpected containers, vintage fabrics, painted furniture and well-worn books. This isn't a home where everything matches and that makes the rooms even more enchanting. They're decidedly and lovingly filled with whatever things bring joy to the inhabitants. Come with me and explore the beauty and simplicity of a cottage life, no matter where you live. All material on this blog is mine unless stated otherwise. If you'd like to use or publish anything you find here, please contact me for permission. I'm easy to get along with.